By day I work from an office and by night I work from home. My home office is more than an office, I write my articles (my home business) there, but it is my digital life when I am playing World of Warcract on my PC or writing for my website. When I am working from home I am really bad at getting a work-life balance; but with some simple tips, we can increase your productivity whether you are self-employed or a telecommuter. We look at the way you dress, the way you think of your home office and the way you manage your time. With a few of my tips you will start to feel more professional, reflecting in you wanting to work more professional and producing professional results; whether your home based business is a call-centre, writing articles or international Skyping. If you have just finished working for an employer and heading into self employment then your big change will a big shock to your system. One of the best ways to adapt to this is by either having a completely separate room for your work, or a section of a room which is dedicated to your home business. You might consider that buying separate computer equipment for it will help distinguish your home and work life, or you could consider buying a cheap and cheerful laptop or tablet computer for when you are at leisure in the lounge. Your home office does not specifically need a whole room. Many "open-plan"offices do really well with portable walls, creating cubicles for their staff to work in; you can do the same using an L-shaped desk to segregate your office space. When I am looking at office furniture I will use popular Swedish retailer Ikea to get ideas or to buy what I need to build a bespoke layout. Most importantly though, spend some time and money getting the best furniture for your home office. I don't mean spending a few months salary on the office chair; just something feels like it is YOUR office chair and not the offices, office chair. If you are comfortable and feeling professional in your new home office, you will feel and act professional in your new home business. Your office is also your workspace so you should treat it the same; I make sure that when I am working from home I still wear something that tells me I am in the office. Admittedly I do not get into a suit to work from home but I still put on a clean shirt and pair of good trousers that I would expect to wear in an office. If I am sat at the computer in a pair of shorts, bermuda shirt and flip-flops I just don't feel like I am at work and the results reflect that. A company I have done some work for use many staff in single-person, company owned offices. These staff do not deal with customers face-to-face so they have eroded the need for a uniform over the years; now they spend more time on "personal" agendas than the work expected of them. Productivity has gone down and mistakes have gone up. The offices are now being merged so that a manager can oversee them. This will mean that those working overnight will have to lose the sofabeds and stop taking their computers to work to play World of Warcraft. 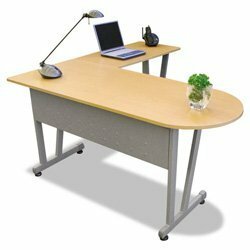 Having an L-Shaped desk can help you turn the corner of your room into a separate office. You've Only Just Left the Office! If this is the first time you are working for yourself or from home for someone else, you are going to need time to adjust. It is not just that you no longer have a boss looking over your shoulder; but that there is no-one to chat over the water cooler to, the only contact you might have is on the phone or e-mail, and the temptation to Facebook all day is high. One solution if this is your first chance to work from home is to still socialize with your work friends. Meeting up for a coffee during their lunch-break or a few beers after a long week in the home office might be just be right for the worker who has suddenly gone from being social to being a hermit. For some there will be the feeling of socially exclusion so the chance to have a quick chat with a colleague over the water dispenser or the coffee machine has been replaced with talking to the kettle in your kitchen. If you are working from home for the first time then it might mean you make changes to the work that you take on, the hours that you work or even the room you make your office; but every person is different and every process of change will take new turns and adaptations. They Wouldn't Harass You at Work.... Would They? Although the temptation is there to be on the end of a phone line to friends and family "because you can," doing it will cut your productivity. Turning off the mobile phone, disconnecting the Facebook Chat and making sure the Skype goes on business and not pleasure is the best way forward; at least in the beginning when you are working so hard on your transition. Workplaces with an emphasis on safety ban mobile phones in the workplace so why not do it in your home office? One of the problems with working from home is that people often think that you will have all the time in the world to do what you want, when you want and take a break to talk to them... when they want. If you were at work in the office you would not spend all day on your smartphone tweeting your friends; so wait until you are snuggled up on your sofa with a tablet computer and a mug of mocha before catching up on the Internet edition of your best friends soap opera. For those that work from home and are heavily computer based; it is a good idea to sign up to Skype and buy a separate telephone number which forwards to your Skype software. It can be cheaper than getting a second telephone line and you can take it with you if you decide to work in the garden or while on a weekend break; your customers or telecommute employer need never even know the difference between calling you at your home office on your Skype number, or calling you at a quiet hotel bar. This is something that I fell victim to when I started my first semi-professional (albeit voluntary) role as the Chairman of a charity. I did not back-up my home computer anywhere near enough to make the work that I did recoverable. I had worked hard on a new project when I did my first back-up and over the course of 5 days had managed to re-write almost all the documentation for the project. On day 6 disaster struck when the hard disk drive died and all I had was the original document before I had made hundreds of alterations. Backing up your computer is so easy that it can be done automatically overnight, weekly or as often as you need! Network-Attached Storage is now easier than ever to buy, set-up and configure. It is important to remember that having a back-up in your home means that in a disaster such as a major house fire you still risk losing everything, but at the same time it is far more likely that your hard disk drive will fail. If you are looking to save money you might have an old computer lying idle; it is really easy to build your own NAS file server and place somewhere in your home to back-up not only your desktop computer; but also any laptops and even smartphones that you might own. Remember though, for this to be the most effective you need to keep it away from the devices that your original files are on. 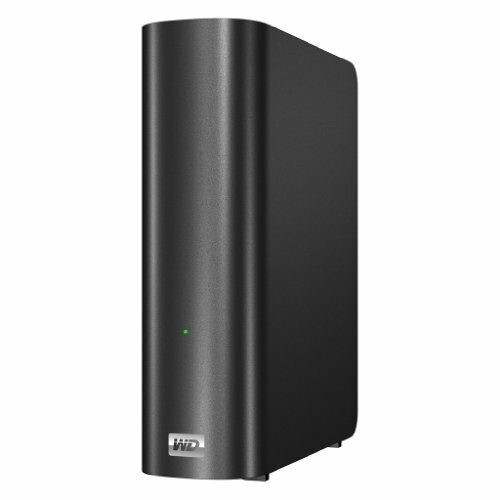 Western Digital are one of the leading manufacturers of good hard drives. I almost exclusively rely on them for the hard disk drives inside my computers. This is a back-up drive which you can connect to a network router using an ethernet connection. Combine it with Powerline adapters in your network to place it near any power socket in your house. One of my problems is the problem of defining what is work time and what is home time. With the increase in the number of digital TV channels available, being distracted by the TV is something that every home worker can do without; reducing productivity. Jerry Springer must sometimes need turning off so that you can write that report or finish off your tax return, so build yourself a schedule and stick to it. If you have a role where you have to have free time to schedule meetings then start off by working out what hours you definitely can not work. In many cases you will actually have a choice of dates and times that you have for a social occasion; a film at the cinema is shown many times a week and so if you have a range of options to go see it, you can be flexible to incoming meeting requests while keeping your promises. Something which I have forced upon myself at home is that checking e-mail should be done mid-morning. If the first thing you do is open Microsoft Outlook (or your alternative e-mail client) then there is a good chance that answering e-mails is where you will spend most of the day. Something I always have to mention when someone asks me about home working is make sure your taxes and accounts are in order. Even for the simplest of business set-ups accuracy of the accounts and appreciation of what expenses you can and can not offset in your accounts is the most important part of your business. For small sole trader businesses accounts are not always overly complicated as you (in the UK) only have to complete a self-assessment tax return in most cases. Keeping your records up-to-date must be done regularly, but how regularly depends on how often you have income and expenditure; those with one or two incomes at the end of the month could get away with updating records every month or two, whereas those that have lots of smaller transactions will want to do this more often. Because of the regular tax changes and the worldwide differences in taxes I am against offering specific advice on here. The following is based on my experiences in the UK - you should always take professional tax advice. Something that can get overlooked by home workers is the fact that part of your home is now classed as business premises. English Council's have rules in place for residential properties becoming business premises and if you are looking to convert a whole flat into a call centre then you need specialist advice. Using the computer in the dining room as an article writing terminal or doing office work is not normally an issue though. Council officers have a strict set of guidelines in most instances and if you are using domestic computers for working from home on an occasional basis, or just for keeping an electronic set of accounts and generating invoices; most councils will not go to the trouble of taking proportions of your Council Tax and making it Business Rates and backdating it and threatening you with court action for not notifying them, etc, etc. If you have a room that you use solely for business, you lock when you are not using it for business and has a couple of filing cabinets full of invoices and accounts and research then they might take a different view and charge you Council Tax for your residential premises and Business Rates for that single room. I can not tell you how much I enjoy being able to try earning some money from home. I would like to work from home full-time and manage my time in the best way possible but at the same time I know I can not take the risks associated with self-employment. Just like many people enjoy working in the office, it is possible to enjoy working from home whether as a telecommuter or as a self-employed business. These tips can help you move forward to better home working methods that you might already have, or they might convince you to try working from home for the first time.